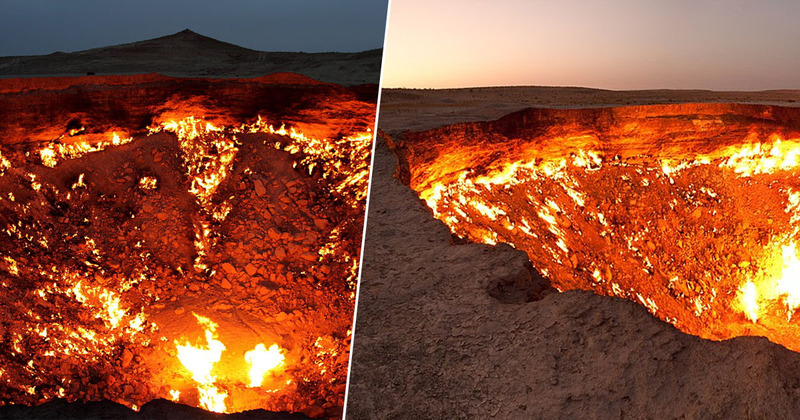 A drone has captured footage of the Darvaza crater, a flame pit in the middle of the Karakum Desert in Turkmenistan, known as ‘The Door to Hell’. The 69 metres-wide by 30 metres-deep crater flame pit has burned for more than 40 years. It lies 150 miles from Turkmenistan’s capital, Ashgabat, and looks to be straight off the pages of the Star Wars script thanks to its scary resemblance to the Sarlacc. Still, hundreds of brave tourists travel to the destination every year, despite the tourism board’s best efforts to encourage people to avoid the dangerous wonder. It’s thought to be man-made; born of an engineering accident in 1971 when a Soviet mining rig collapsed. So, it’s not exactly natural, but it’s just as popular to tourists who flock to the sparsely populated Derweze region. The heat in the burning hell mouth can reach up to 1,000°C (1,830F). Luckily, a drone-flyer found a pretty safe way to look straight into the mouth of the pit, using his flying tech to take some aerial photography. The story goes that at the time of the Soviet Union, Russians heavily drilled the desert seeking natural gas in the fourth richest country in the world for natural gas reserves. Some miscalculation led to machinery, and most probably operating engineers, falling into the ground. As gas poured into the atmosphere – making it impossible to live in small villages even at a great distance in the desert – the best option was to light up the gas and wait for the gas field to dry up. But this didn’t happen and it has been astonishing visitors ever since. This story is not something to be proud of as tourism is not really welcomed by the authorities. As if this close-up view wasn’t enough, in 2013, one group did conduct an expedition into the mouth of the crater, led by a world-famous Canadian explorer. George Kourounis, 44, descended 100ft down into the crater and walked across its surface. The Toronto native heard a rumour the Turkmenistan government was planning to extinguish the flames, and decided to visit the location, with the aim of collecting samples of dirt to be analysed. He stayed in the crater, cloaked in a heat-reflective suit, breathing apparatus, and a custom-made Kevlar harness, for a whole 15 minutes and ended up finding unsuspected bacteria in the hot environs.